Over the past two years, Listerhill Credit Union ($752.6M, Sheffield, AL) has redefined itself from the ground up. So says Chris Anderson, the Alabama-based institution’s marketing director. In early 2016, after introducing a new mission, vision, and value statements, the credit union launched a campaign to introduce an updated logo and tagline — It’s All About We — to better fit its community focus. “It took us a few steps to define who we were,” Anderson says. As such, the credit union recognized employees needed a crash course on the brand before they could tout, and live, it. “It was crucial to get our employees' buy-in to make it a part of the culture,” Anderson says. To get that buy-in, the credit union held a one-day brand camp in March 2016 in its main office auditorium in Muscle Shoals, AL. During the multi-session seminar, employees learned how Listerhill was re-defining its brand and how employees at all levels could have a positive impact on that brand. Brand camp attendees broke the ice playing “Who Am I?,” a guessing game using the traits of famous figures, before settling in for a presentation run by Listerhill’s chief of staff on the retail side, Kristen Mashburn. In it, Mashburn underscored the role every employee plays as a brand ambassador. She related the story of the lost stuffed animal Joshie the Giraffe and the exceptional customer experience exhibited by a Ritz-Carlton employee in reuniting toy and child. Mashburn also asked attendees to describe the brands of Chick-fil-A, Comcast, and Apple — the positive, the negative, and the head-scratching — to encourage thinking about how small details build into an overall opinion of a company. “Everything we do communicates something to someone,” Mashburn says. With the groundwork laid, the chief of staff presented two sets of survey results highlighting how members and employees viewed the Listerhill brand. Then, she introduced Listerhill’s new mission, vision, and values. In March 2016, Listerhill introduced a mission, vision, and values that underscored its community connectedness. What does “It’s All About We” mean? It’s a reminder for all employees that the credit union exists to better the financial lives of its members as well as its community. What the credit union does is all about what “we” — the credit union’s members and employees — can do together. Contestants of Me or We spin a wheel with “Me” or “We” panels. If the spinner lands on “Me,” they get a prize, such as a branded koozie. If the spinner lands on “We,” the credit union donates $1 to charity. The credit union now takes the wheel to community events and chooses charities that tie in with the event. Launching in August, CUBrandMonitor helps credit unions monitor their social media, branch reviews, rankings, online listing, and more. To celebrate the launch, we’re offering you a preview showing how CUBrandMonitor will help you manage your credit union’s online reputation. Finally, brand camp attendees received a brand book and a brand box that reiterates topics and learnings from throughout the day. That’s where the brand box comes in. The cardboard box contained branded items such as Big Red chewing gum, coasters, coffee, and a deck of cards. 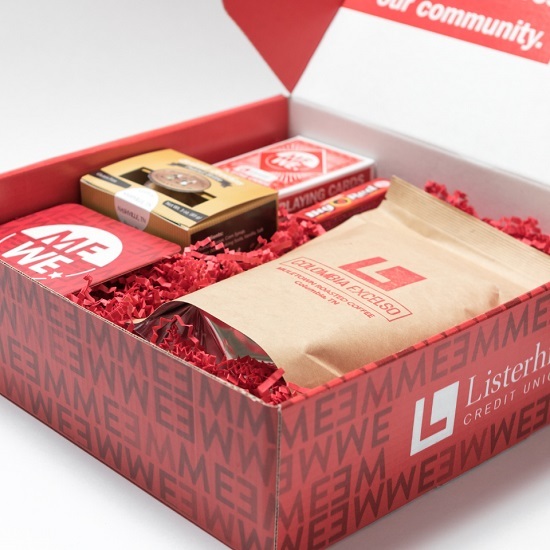 Listerhill's brand box came filled with coffee, chewing gum, coasters, and playing cards. 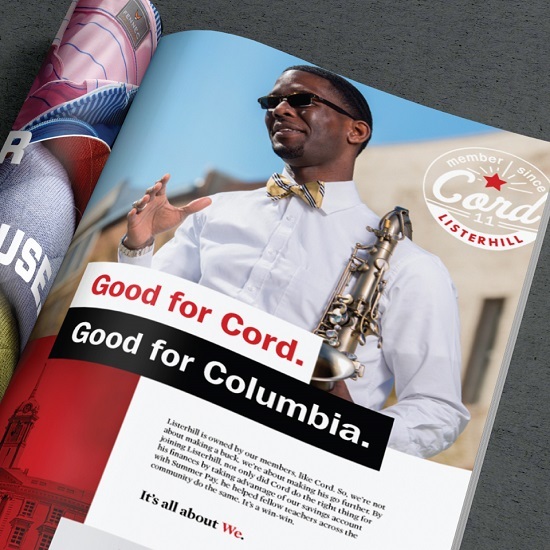 Listerhill is promoting alternative taglines — such as “Good for the member, good for the community,” and variations like “Good For Cord, Good For Columbia,” or “Good For The Fredericks, Good For Florence” — via print and digital marketing collateral. For Listerhill, what's good for the member is good for the community. Listerhill launched the “It’s All About We” campaign in early 2016 and is quantifying results using the net promoter scoring system. So far, the credit union has posted 12-month member and loan growth well above state-based peer averages, but it’s difficult to correlate that performance to the brand initiative. That said, anecdotally, Anderson has seen changes internally. “For us what was important was that our message was consistent throughout all aspects of the campaign. We weren’t trying to be creative for the sake of being creative. We weren’t just checking boxes. We were trying to be strategic. There was a reason we did everything we did — we wanted to tie our message back into our ‘It’s All About We’ campaign," says marketing director Anderson. What happens at camp, stays at camp. This one time, at brand camp . . .